Earlier this fall, we wrote two posts (here and here) reviewing trends in corn and soybean seed expense. 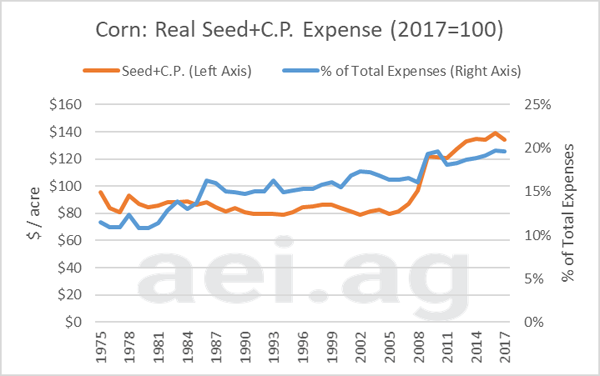 While the upward trend in expense per acre was not surprising to most readers, the rapid change in other seed expense metrics - such as expense per bushel, share of total expenses, or share of budgeted revenue- was perhaps more revealing. These posts prompted reader questions about crop protection expense trends and, in this week's post, we review these for corn and soybean production. Before diving into the charts, a comment about the data. The USDA's ERS publishes national cost of production data for corn and soybeans. Data used for this week's posts were reported as "chemical expense." Admittedly, this is a broad category. Furthermore, these data are a national average. Figure 1 shows real, or inflation-adjusted, crop protection expense for corn production since 1975 (in orange, left axis). Overall, inflation-adjusted crop protection expense has trended lower over time. In 2017 dollars, crop protection expenses of more than $40 per acre were common before 2000. Since 2000, crop protection expense has been less than $40 per acre. The expenses even dipped below $30 per acre for several years. Similar to the seed expense posts, Figure 1 also shows crop protection expenses as a share of total expenses (in blue, right axis). Throughout the late 1980s, 1990s, and early 2000s, crop protection was roughly 7% to 8% of total expenses. More recently, this has fallen between 4% and 5%. To illustrate this a bit differently, the USDA reported seed and crop protection expense in 1980 were both $14 per acre (in nominal terms). They each accounted for 5% of total production expenses (10% combined). In 2017, nominal corn seed expense was $99 per acre with total chemical expense at $35 per acre. In 2017, seed expenses accounted for 15% of total expenses while chemical expense was 5%. These two inputs, which had a very similar impact on crop budgets in 1980, have undergone very different trends over the last 40 years. Figure 1. 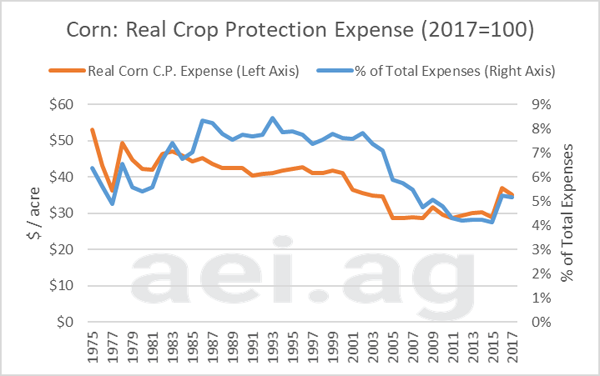 Real Crop Protection Expense for Corn (2017=100), 1975 to 2017. Data Source: USDA�s ERS. Figure 2 shows crop protection expense for soybeans. Similar to corn, soybean crop protection expenses have also trended downward. On a per acre basis (in orange, left axis), soybean crop protection expense shifted from mostly $40 per acre, or more, before 2000 to less than $30 per acre in recent years. As a share of total expenses (in blue, right axis), crop protection has represented a smaller share over time. Accounting for more than 10% of total expenses in the 1990s, crop protection currently represents 6% of total expenses. Figure 2. 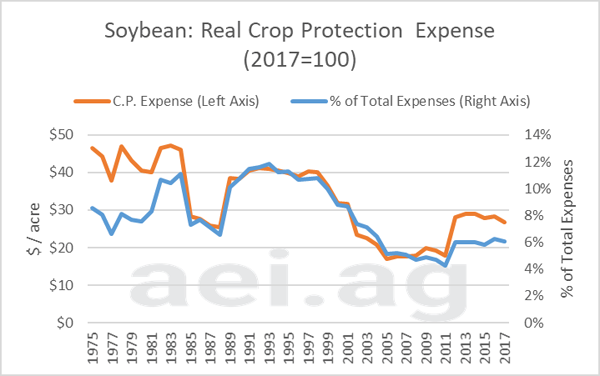 Real Crop Protection Expense for Soybean (2017=100), 1975 to 2017. Data Source: USDA�s ERS. After looking at seed and crop protection independently, it left us wondering about the combined trend. This is of interest given the integrated role seed has played in crop protection. These data are, again, adjusted for inflation. Figures 3 shows combined seed and crop protection expense for corn production. Shown in orange is the per acre expense. Before the mid-2000s, this expense remained near $80 per acre. More recently, the combined expense has exceeded $130 per acre. As a share of total expenses (in blue, left axis), the inputs have accounted for a large share over time. Accounting for less than 10% in the 1970s, this has recently approached 20% of total expenses. For soybeans, the combined expense has also increased over time (Figure 4). In 1970, combined expenses were $20 per ace in the 1970s. This has increased to nearly $85 per acre in 2017. As a share of total expenses, these averaged 15% of total expenses in 1980. Recently, the share has increased to 19%. Figure 3. Real Seed + Crop Protection Expense for Corn (2017=100), 1975 to 2017. Data Source: USDA�s ERS. 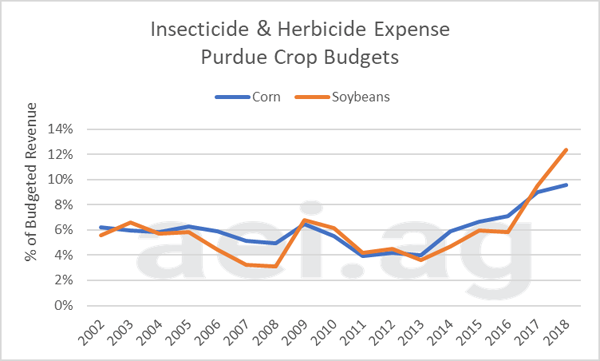 Figures 5 and 6 consider the budget expenses for herbicide and insecticide in the Purdue Crop Budgets. These data are from 2002 to 2018. Figure 4. 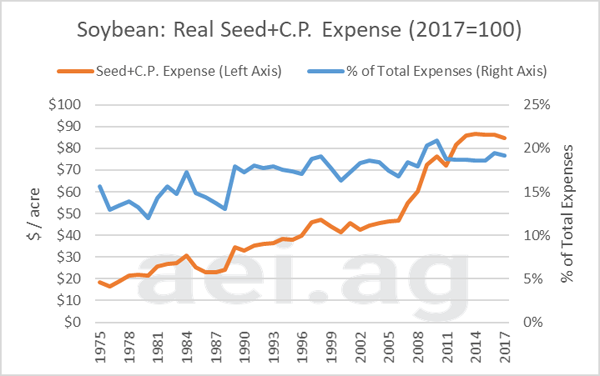 Real Seed + Crop Protection Expense for Soybeans (2017=100), 1975 to 2017. Data Source: USDA�s ERS. Figure 1 shows the per acre expense for corn and soybeans (these are nominal data; not inflation adjusted). For both corn and soybeans, this expense was less than $20 per acre before the farm economy boom. The expense stepped higher around 2010, reaching $40 per acre for corn and $30 for soybeans. For the 2018 crop budgets, herbicide and insecticide expense exceeded $60 per acre as producers struggle with herbicide resistance issues. Figure 5. 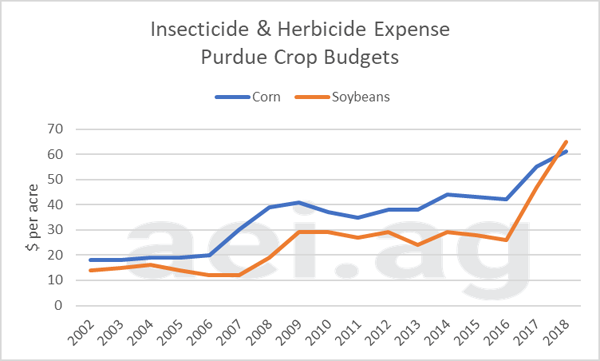 Budgeted Insecticide and Herbicide for Corn and Soybean Production ($ per acre), 2002 to 2018. Data Source: Purdue University Crop Budgets. Crop protection expense for corn and soybeans has trended differently from seed. At the national-level, crop protection has trended lower over the last 40 years. This has occurred on a per-acre basis and as a share of total expenses. In short, crop protection has accounted for a smaller slice of corn and soybean budget over time. Figure 6. Budgeted Insecticide and Herbicide Expenses as a Share Budgeted Revenue, Corn and Soybean. 2002 to 2018. Data Source: Purdue University Crop Budgets. At the national level, combined seed and crop protection expenses, for both corn and soybeans, have trended higher over time. This is the case on a per acre basis and as a share of total budgeted expenses. The summary here is that producers are spending more today than they did in the past. The questions of 'why' producers are spending more is important, but beyond the scope of this post. To consider this, one must consider a host of factors including, but not limited to, pricing, management decisions/preferences, and agronomic challenges. Perhaps the most interesting observation in the crop protection data has been a significant uptick in expenses in recent years. This has been observed at the national level and in the Purdue crop budgets. Producers will need to carefully consider their crop protection expenses, especially herbicide, given agronomic herbicide issues.